Let me give you a little back story to these wraps. I’ve recently reconnected with a good friend from high school via Facebook, Instagram, and her blog. Thank you internet! She stated she was starting a whole foods reboot like Whole30 and told me to do it with her we could be accountabilibuddies (my word not hers). In a nut shell (not peanut) Whole30 is a commitment to eliminate gluten, grains, dairy, alcohol, sugar, and legumes from your diet for 30 days. The testimonials about how great everyone feels afterward really intrigued me. For the last eight months I have been dealing with horrible stomach pains and medical tests are showing everything is with in the “normal” range. It has been frustrating. It has effected me/my life so much. I am moodier, sadder, and more frustrated than ever before. So I have hopped on the band wagon to see if I can change the way I feel with food instead of taking pills and pain medications daily. These wraps were devoured promptly at dinner last night sans sauce. 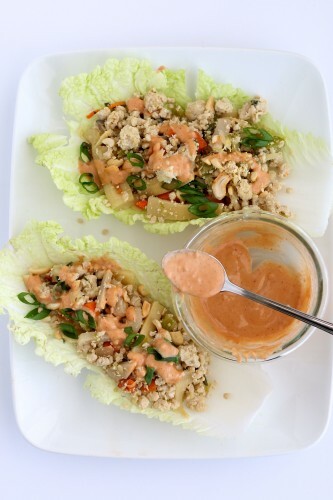 Today I thought a spicy Thai peanut sauce would work so well. So off to the kitchen I went to mix something up. Peanuts aren’t compliant on Whole30 so cashew butter would work instead. After mixing and tasting and devouring I double checked the Sriracha label and saw it contained sugar. Boo! I could have cried. So if you’re doing Whole30 the sauce isn’t compliant but it is AWESOME. I learned the lesson that you need to always always always read labels and don’t assume that it doesn’t contain sugar because EVERYTHING seems to contain sugar in one sneaky form or another. Ginger, garlic, scallions, water chestnuts, bamboo shoots provide great Asian inspired flavor to the ground chicken breast. I ground my own chicken using my Kitchenaid attachment that my in-laws got me for Christmas. Instead of soy sauce I used coconut aminos which provided the soy sauce flavor. You could use regular soy sauce if you’re not following Whole30. 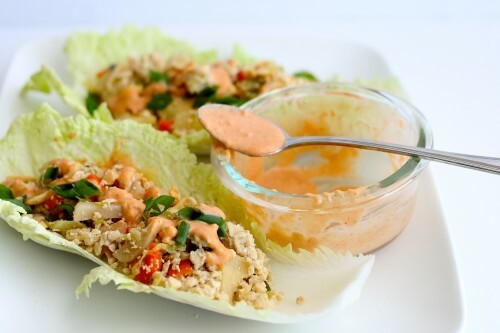 Traditionally wrap fillings like these are put in butter lettuce. 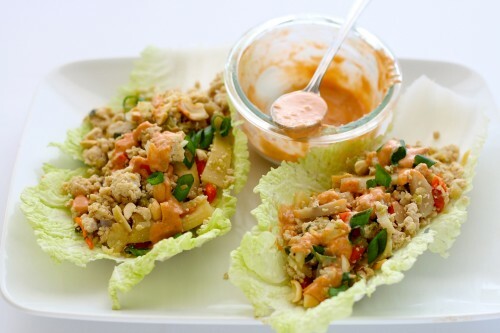 They provide a nice bowl but for me napa cabbage is truly an Asian vegetable and I loved them with this dish. Wrap them how you like though. 1 teaspoon sriracha *if you like super spicy add more! OMG, Jamie, I’m SO excited that you’re trying the Whole30!!!! I just did it recently and know that it will help with the issues you’ve been having. It didn’t do anything for me, but in 2013-14, I gave up sugar/gluten/processed foods/fruit – and lots of other stuff – for about a year straight… so I’d already done a much stricter version of the Whole30 and for longer. 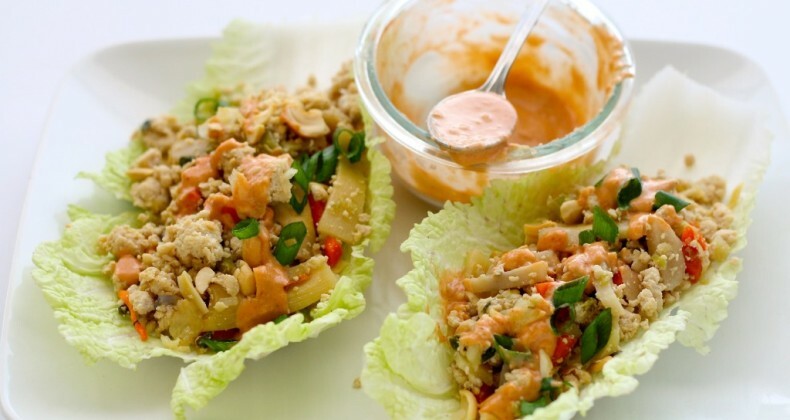 OH, and P.S… these lettuce wraps look AMAZING!! Muah. These wraps look great, and sauce does look like awesomesauce!